No cheating here. Rta Kapur Chisti teaches her students how to tie a sari’s without the use of pins or pre-stitching in her book available at Amazon. Calling Mommy dearest to put on your sari may not be necessary anymore thanks to a Sari School with many locations across India. 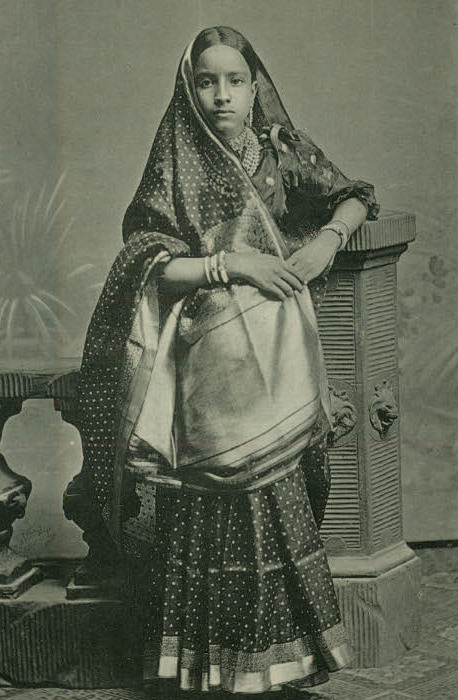 Young girl in Gujarati style sari, 1880. Rta Kapur Chisti, author of Saris: Tradition and Beyond, started the school in 2009 as a way to promote the livelihoods of the sari weavers, printers and dyers and to ensure that future generations of Indians continue to wear this garment. The school provides two to three hour long courses to learn one of the 108 ways to wear a sari from Gujarati to South Indian. “The sari can reinvent itself to become a long or short dress, a pair of pants or even shorts or a formal gown,” says Chisti.